Dillon Gee got scared when team doctors told him they couldn't feel a pulse in his right arm. Nine days later, a relieved Gee is talking about pitching for the Mets again this season. The right-handed starter had surgery in St. Louis on Friday to patch an artery in his pitching shoulder — to prevent another blood clot from forming like the one that gave him such a fright. He was released from the hospital Monday. "This thing came out of the blue. It hit me real fast," Gee said on a conference call Tuesday before flying back to New York. "It was very scary at first, tough to go through. Once we figured out I was going to be OK, my feelings went from being scared to being disappointed really fast." Gee had occasionally experienced numbness in his right middle finger the last two years but never thought much of it. On July 7, he pitched eight strong innings in a 3-1 home victory over the Chicago Cubs. The next day, something was definitely wrong. "My entire arm just felt so tired and heavy," Gee said. "The hand was going numb." He went to the training room and wound up in a New York hospital, where doctors used a catheter to break up the blood clot. His wife was there, terrified too, but they quickly learned his life wasn't in danger. Doctors told Gee the clot could have moved only to his hand. "Everything flashes through your mind at that moment," he said. "It went from being, 'Am I going to be all right?' to 'Am I ever going to pitch again?' to 'How long is this going to take?' It was so many emotions." Gee kept asking whether he'd done something unhealthy to cause the problem. Doctors assured him this had no connection to how he took care of himself. Pitchers put so much torque on their arms, he was told, that it sometimes causes the artery to stretch and kink. His artery had narrowed, resulting in the clot. "I'm as healthy as any other kid 26 years old, an athlete," Gee said. "It was just a freak thing that happens to some pitchers. I was just unlucky in that regard." If the clot had not been treated quickly enough, the muscle tissue could've been damaged, jeopardizing his career. Instead, the news was good coming out of Friday's surgery. There were two options going in: If the artery was compromised, doctors would have needed to replace it with a vein from his groin area. But the artery was smooth, just too narrow, so the vein was used to expand it. Gee should no longer be at risk for future blood clots. Gee, who is on blood thinners, can't do much more than rest for now. But after a three-week checkup, he expects to begin some cardiovascular work and light shoulder exercises. And after his six-week checkup, he hopes to be cleared to throw. 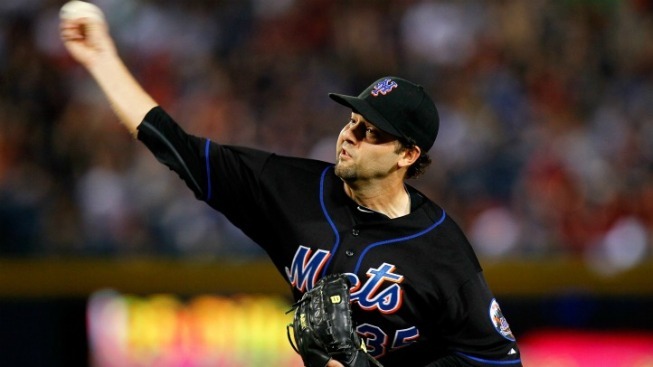 Gee is 6-7 with a 4.10 ERA and had been one of the Mets' most effective starters before the clot. He was the second member of New York's opening-day rotation to go down with a serious injury, joining Mike Pelfrey on the disabled list. "I just felt bad, like I let the team down," Gee said. Since there was no structural damage to his arm, Gee is optimistic it won't take long to regain his strength. "I'm not going to jeopardize the rest of my career to get back this year," he said, "but if I feel good, I would love to finish the year throwing again."